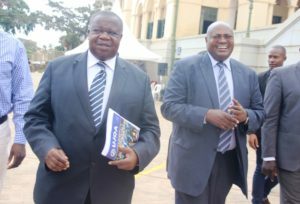 Justice minister Kahinda Ofafiire (left) with Principal Judge Yorokamu Bamwine leave High Court in Kampala after a meeting aimed at resolving the judicial officers grievances recently. Courtesy photo. Government yesterday agreed to address some of the grievances of striking magistrates and judges nine days into a nationwide sit-down strike that has paralyzed judicial work across the country. In a statement from the Justice ministry that PML Daily has seen government has committed to avail judicial officers with vehicles security detail and working equipment. The judicial officers have been on strike since Friday July 25, pushing for salary rise, transport means, housing allowance, medical insurance and an increment on their operational fees. Addressing journalists at the Uganda Media Centre yesterday, Justice and Constitutional Affairs minister Gen Kahinda Otafiire said government was committed to addressing all the issues that prompted the strike. “Cabinet has ordered the Ministry of Public Service to review emoluments of all public servants including judicial officers before October,” Otafiire said. He said the issue of salaries will be reviewed across all sectors of government to ensure equity, affordability, sustainability and adequacy. The minister called upon all judges and magistrates currently on strike to resume work as government moves to address their grievances. But Uganda Judicial Officers Association (UJOA) president Godfrey Kaweesa said calling off the strike will require consensus from all members.